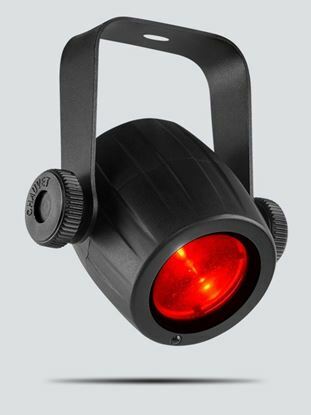 The Chauvet DJ EVE E-50z is an LED Ellipsoidal / profile spot light. Used to highlight stage areas, and project patterned gobos. EVE F-50Z is an LED Fresnel fixture that shines a soft-edged, warm white spot and features D-Fi™ USB compatibility for wireless master/slave or DMX control. EVE TF-20 is a compact, energy efficient, soft edge LED accent luminaire that can function as a regular PAR can, while its classic Fresnel style emulates stage and theatrical lighting. Conveniently included barn doors block light from unwanted areas, letting you focus on a particular space or object. Intimidator Spot 155 is a bright, compact, and lightweight LED moving head, perfect for mobile applications. Rely on it to energize any dance floor with fast and precise movements, crisp optics and even output. Built-in performance features like separate color and gobo wheels, ultrasmooth dimming and adjustable strobe speed enhance any light show. Minimize programming time with built-in movement macros, move-in-black features and sound-activated and automated programs that can generate a synchronized show in master/slave mode. This user-friendly fixture also offers individual reset of pan/tilt, color, and gobo. Multiple units can be power linked to save time running cables and extension cords. Fits best in the CHS-X5X VIP Gear Bag. The Intimidator Spot 455Z IRC is an extremely bright, 180 W LED moving head spot designed for large events. It features dual gobo wheels that allow for gobo morphing and amazing mid-air projections. The motorized zoom is perfect for short- or long-throw situations. The Intimidator Spot 455Z IRC beams always remain on the dance floor using the built-in, innovative Totem mode. You can also split the beam and cover a larger area with the Intimidator Spot 455Z IRC’s 3-facet prism. This powerful moving head emits crisp projections at almost any distance using the motorized focus. Quickly and easily change gobos using the easy-access gobo door and non-DMX control is easy with the optional IRC-6 remote. The Intimidator Spot 455Z IRC also allows you to set, save, and recall 1 scene manually directly from the full-color LCD display. Link multiple units together with the power-linking feature which saves time from running cables. The Intimidator Spot 455Z IRC fits best in the CHS-50 VIP Gear Bag. Intimidator Wave 360 IRC brings a “wave” of excitement to your next event. 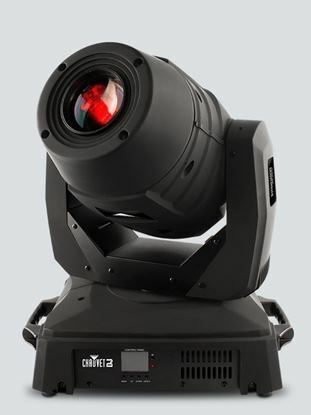 This dynamic effect features four independently controlled 12-watt RGBW LED moving heads on a single rotating base. With its razor sharp beams, continuous pan rotation, adjustable tilt ranges and infinite color mixing capabilities, the Intimidator Wave 360 IRC produces the kind of astounding lightshows that set you apart from the pack. Up to four units (16 moving heads in all!) can be linked in automatic, sound or master-slave mode. An optional IRC-6 remote can be used for non-DMX control. LED Followspot 120ST is a portable, LED followspot that emits a tight beam powered by a bright 120 W LED to highlight actors at far distances. Built-in CTO filter lowers color temperature to match tungsten lamps. The LED Pinspot 2 includes two front focal lens options to produce hard-edge beams for a variety of applications. The LED Pinspot 2 is extremely lightweight, at less than one pound, and is powered by a 3W white LED. LED Pinspot 3 is a palm-sized pinspot that can be turned on/off and dimmed from a distance via the optional IRC-6 remote. A pack of 5 gels is included to let you easily change colors.